There is an Ezi-action® Adaptor Fitting to secure and lock the drum pump into every common thread configuration for bulk containers with at least a 42mm wide opening. 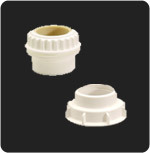 For internal threaded openings we provide Ezi-action® M Adaptor Fittings. In UK and Europe the M55, M69 and MBSP are the most popular fittings. For external threaded openings we provide Ezi-action® C Adaptor Fittings. In the UK and Europe the C57 and C63 are the most popular fittings. Effective securing of Ezi-action® Drumpump into two styles of drum with one fitting. 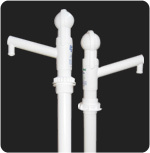 Simplifies the number of fittings required. Less plastic so better for the environment. 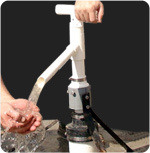 Hand tightening secures the Ezi-action® Drum Pump into the barrel or container. 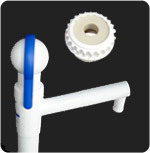 Chemical resistant locking ring grips the drum pump shaft when the Ezi-action® Adaptor Fitting is tightened. Will slide when loosened and can be positioned anywhere on the shaft. 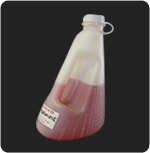 Allows transfer of Ezi-action® Drum Pump between different drums and containers. Do you need a different Ezi-action® Adaptor Fitting to that supplied with your Ezi-action® Drumpump? Check out the information below and contact us. We are here to help. To determine your Ezi-action® Adaptor Fitting either follow the easy video instructions or scroll down to the written instructions. 3. Watch the correct video to see how to install the M or C Ezi-action® Adaptor fitting you have. How to install the Ezi-action® M Adaptor Fitting. How to install the Ezi-action® C Adaptor Fitting. For IBC containers, view the video below for Ezi-action® Adaptor Fitting installation. Do you have an unusual drum or container opening? 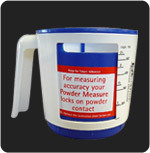 We have a solution from varying the size of an O ring to customising a specific fitting. We are pleased to work with you to ensure you get the best fitting to secure your Ezi-action® Drumpump into your barrel, bulk container or IBC.